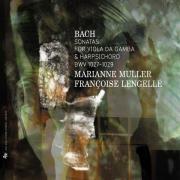 Repeated listening to Bach’s Sonatas for viola da gamba and harpsichord deepens one’s sense of their formal variety within a very focused stylistic ambit, reminiscent of the language of the Brandenburg Concertos perhaps most especially. Another striking trait running across all three is the role of the sustained pedal-notes exchanged in dialogue between the protagonists, which poses a challenge to both. These two French musicians cultivate a no-nonsense approach, the hallmark of which is steadiness and solidity. There is little discernible play within or between beats in the faster movement (as attested by the solo harpsichord movement of BWV1019 also included here), and a seeming decision not to milk the expressivity of the slow movements. Those who resist a mannered approach to their Bach may well approve but the sustained notes mentioned earlier seem to me to hold the key to a more nuanced approach. The singing style so often evoked by contemporary writers in relation to the viola da gamba requires that they be treated in a spirit, shall we say, of refined sensibility that ought surely to pervade the whole. That’s to say that mannerism ought not to be avoided here but embraced, as in the comparatively recent (2011) recording by Lucile Boulanger and Arnaud de Pasquale for Alpha, for example: a more ‘Frenchified’ Bach, perhaps, but none the worse for it. Another alternative, though slightly rougher round the edges, is from Paolo Pandolfo for Harmonia Mundi, which includes a fascinating transcription of the Cello Suite in D minor – a more satisfying ‘filler’ than the transcribed version of odd hotchpotch BWV1019 offered here.